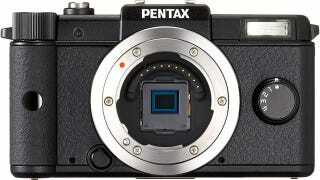 There's a lot to like about the new Pentax Q digital camera. It has a slick retro look, five interchangeable lenses and many features of a dSLR packed into a body that's the size of a point and shoot. The Q slims itself down by ditching the optical finder, mirror box, focusing plate and AF sensor that add bulk to a typical dSLR. What's left inside is an imaging engine with a 1/2.3-inch CMOS image sensor capable of shooting 12.4MP images and recording 1080/30 FPS HD video. Not a slouch, the Q has all the bells and whistles of a dSLR including a wide ISO range (125 to 6400), built-in photo effects, different shooting modes and HDR. On the outside, there's a new rail-thin lens mount system, a 3-inch LCD monitor and a microHDMI port that lets you watch your images and videos on an HDTV.